Lost in the Movies (formerly The Dancing Image): The Prisoner - "A Change of Mind"
Here we finally reach an episode which doesn't attempt to out-do the previous ones in terms of its high concept. This might be the first since "Checkmate" to take a fairly straightforward approach to the goings-on of the Village, without any grand escape attempts, massive twists, or unconventional premises. With that in mind, it's a relief that the episode feels so solid (though I've had some warnings about two of the next three, so I shouldn't breathe too easy yet). With a let's-break-Six-inside-the-community conceit that recalls "The Schizoid Man" and "A., B., and C." but without the cleverness of either, "A Change of Mind" is about as close to a filler episode as I've seen so far on The Prisoner. As such, it hones in on the core hook of the series: the notion that Six needs to maintain his independence and self-awareness in the face of the authorities' challenges to his autonomy. And it reminds us that his "superiors" have limited power. For whatever reason, they don't actually want to overtly manipulate him - even while they want him to think they have that power. "A Change of Mind" begins with an exercise routine nowhere near as ridiculously appealing as the trampoline wrestling in "It's Your Funeral" - perhaps a sign that this will be a unfailingly routine look at Six's challenges. But his outdoor gymnastic bar and punching bag aren't good enough for those who expect him to use the Village gym. Antagonized by two of his peers, Six strikes back and is quickly labelled "unmutual." Naturally, he refuses to submit to the confession written out for him. As he is rejected by the community, he maintains his stoic, sardonic sense of resistance. And maybe that's what they want, as it gives Two (John Sharp) and the "committee" (whom Two highhandedly dissociates himself from) the excuse to lobotomize the disobedient prisoner...or so it seems. 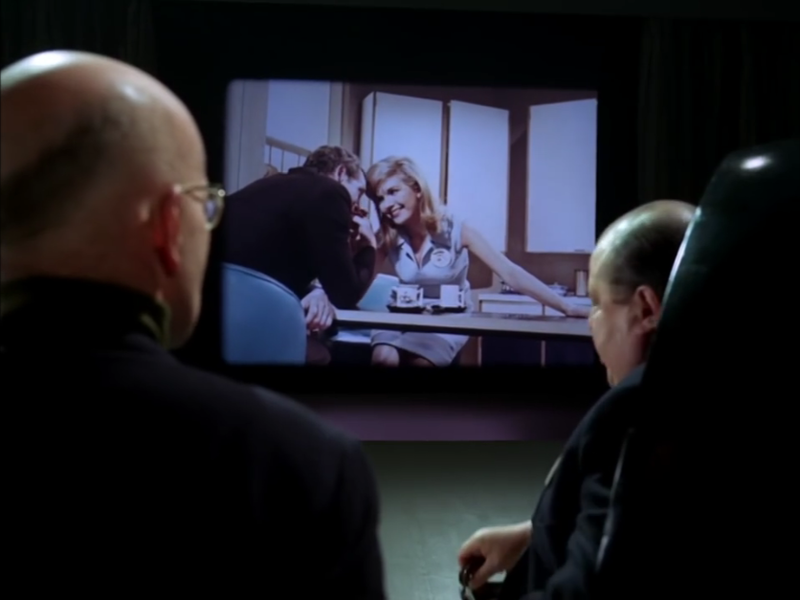 In fact, Six is knocked out just before the operation - euphemistically labelled "social conditioning" - is to take place and when he is revived, he is submitted to a subtle drugging routine at the hands of Eighty-six (Angela Browne), the latest in the show's long line of frosty yet oddly enticing blonde authoritarians. Unsurprisingly, Six is too smart to fall for this ruse. He dumps out his tainted tea one day, and tricks Eighty-six into taking it the next. Once she's under the influence, he hypnotizes her and gives her a mission (which we will only discover in the final minutes). Then, playing the part of the docile subject, he tells Two he would like to make a public speech demonstrating his contrition and submission. Naturally, he uses the opportunity to turn the community against Two - having baited Eighty-six into calling Two "unmutual," he advises the Villagers to defy his authority and think for themselves. Unfortunately, there's something not altogether satisfying or convincing about this. (Speaking of unsatisfying contradictions, why won't Two actually operate on Six, yet he thinks it's kosher to drug him for information? But I digress.) On the one hand, he is brainwashing the Village and using their own mindless conformity to trap Two. On the other hand, he is ordering, er, asking them - almost halfheartedly it seems - to rise up and cast off their chains. It becomes a question of whether his primary goal is to stick it to Two (the individual who is antagonizing him at this particular moment) or to break down the Village (the system that has trapped him from the beginning, no matter who happens to fill the Number Two role). 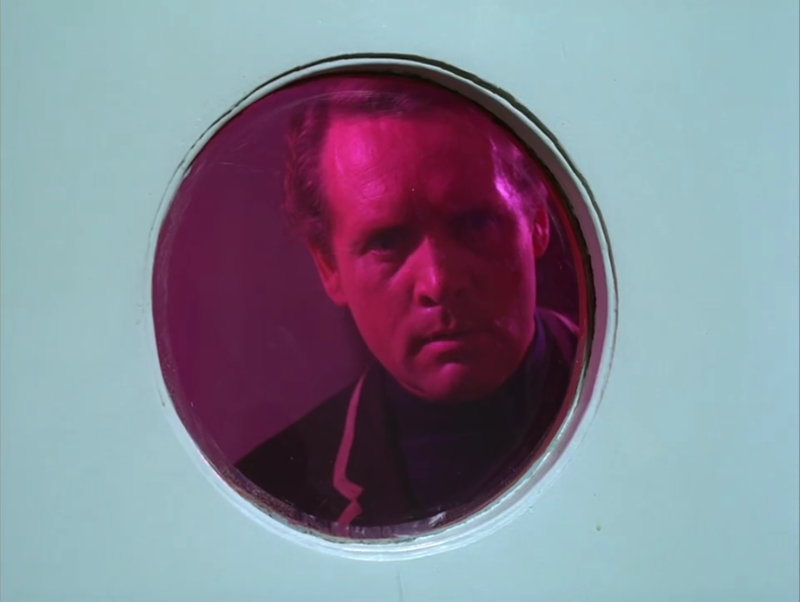 With that in mind, I'd say we're reaching the limits of The Prisoner as an episodic series. Sooner rather than later it needs to grapple with its central concepts and challenge Six to figure out exactly what he wants: his own liberation, justice for his fellow prisoners, defiance of the authorites, or something else altogether (or all of the above, if possible). Watching him incite the Villagers to attack Two, we're a far cry from his egalitarian, if somewhat arrogant, attempts to find allies in "Checkmate." Indeed, watching this episode after the wildly off-kilter "Living in Harmony," I had to consider why Christopher Yohn - my invisible guide through The Prisoner - advised me to place this episode so late in the game. Could it be that he's getting the weakest episodes out of the way before the final stretch? (I said that this was a solid chapter, but "solid" is not the highest compliment for such an innovative show.) As I've just noted, though, watching this as a late episode has the added benefit of reminding us how isolated Six has become, how limited and vindictive are his attempts to defy authority. Maybe I'm reading too much into it, but it seems significant that not only are his attempts to link up with other Villagers non-existent, at no point does he even try to escape himself. It's all about sticking it to this week's Number Two. Not terribly different from his goal in "A., B., and C." but there the stakes seemed higher both because of the greater degree of mind control and the repeat appearance of a Two whose situation seemed all the more tenuous for his familiarity. I can only observe two ways in which "A Change of Mind" offers even the suggestion of a step forward. For one thing, in Number Two's headquarters we see the High Wheeler bicycle which has closed every episode (and appears on the lapel buttons of every Villager). To my recollection, this is only the second time we've seen one there (maybe within the show at all), the previous example being at the end of "Living in Harmony." I still don't really have any clue what that means. Also, this time we probably get more emphasis than ever before on the little man who, aside from Six, has been the most consistent character throughout the series. I've stated my hunch before that maybe he's Number One - or otherwise more important than he seems - and his presence here solidifies that suspicion (along with the fact that he is the last person we see onscreen as the episode closes). Speaking of recurring motifs, we get to see Rover again, albeit very briefly: on a small screen as Six witnesses another unmutual undergoing "aversion treatment." I can't remember if our old spherical pal made an appearance in "It's Your Funeral," but this may be the first time we've seen him/it/(her?) since "The General," or even "The Schizoid Man" (when it devoured Six's doppelganger). Hopefully it won't be the last. Oh, and those bicycles were (and are) called "Penny Farthings" in the UK. The big wheel being like an old pre-decimal penny and the little wheel like an old pre-decimal farthing (which was a 1/4 of a penny, back when a penny was actually worth something).This, believe it or not, will be useful information later on in the series.